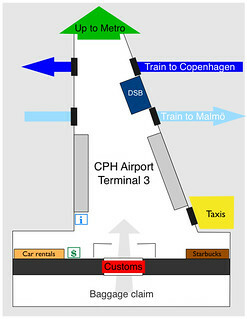 There are three terminals at CPH, with terminal 1 for domestic flights, and 2 and 3 for international. All three are connected so, while stretched out a bit, you can walk from one end to the other. There is also a shuttle that runs, but I’ve only ever walked since I always fly either terminal 2 or 3 and it isn’t that horribly far. Terminal 3 has all the good stuff for getting into the city, and is also conveniently where international arrivals are funneled. This is the area I’ll be talking about in this post. Unless you are arriving from a Schengen country, you will have to pass through immigration. I find that the border control here is very quick and even with long lines, you won’t be standing around for long. Every time I’ve gone through all lanes are for all nationalities so you don’t have to split based on who issues your passport, but just read the signs over the counter to be sure. Once you smile at the agent and they stamp your passport, you are free to roam the Kingdom of Denmark. Well, before you roam the Kingdom, you’ll probably want to pick up your bags. If you are traveling with only carry-on (which is the only way to travel IMHO) then you can leave the sorry suckers behind who are waiting for bags and go straight to customs. Customs here is not as big a deal as it is in the US, where each person is stopped and reviewed individually. Once you have your bags, just proceed to the exit. There are colored lanes for customs, with Blue for arrivals from EU countries, Green for nothing to declare, and Red for declaration. A typical traveler does not need to worry about declaring anything unless you are bringing in more than the maximum amount of liquor (1 liter spirits/4 liters wine/16 liters beer) or cigarettes (200), or items for sale. In the many, many times that I have walked through customs I have only seen a customs official standing there twice, and only once have I seen someone pulled aside to be checked. Pretty much just walk through and go on your merry way unless an official flags you down. Ok, you are footloose and fancy free, but still in the airport. When you walk out of customs you will be greeted by a wall of people waiting for arrivals. Walk straight out beyond them and you will be in the heart of terminal 3. Here is a super short video which gives some orientation from the perspective from the arrivals area. The airport is well connected to the city with public transportation. The end of one of the city metro lines terminates here and there is a regional train stop under terminal 3. All public transport in Copenhagen (metro, regional and commuter trains, and buses) use the same ticket and the same zone system for calculating fare. You can buy one ticket and then use whatever means you want to get where you are going. The important thing to know when coming from the airport is that you will need to have a 3 zone ticket to get into the city. You can buy them at the DSB ticket office, which is located on your right and ahead as you walk straight out from the arrivals area, past the check-in counters. You can either walk up to the window and ask a person for what you need or use the ticket machines on the side. The window personnel all speak excellent English and know what ticket you need so it is the simplest way to go. If you walk up to the metro platform and you forgot to get your ticket in the terminal, there is a ticket machine right there as well, often with a DSB person hanging around to assist confused tourists. All you need is a single 3 zone ticket (34,50 DKK / $5.80 / 4,60€) to get to the city. Children (børn) under the age of 12, accompanied by an adult, travel free. Children from 12 to 15 years old get a reduced rate ticket (23 DKK / $3.90 / 3,10€). Your ticket will be time-stamped when issued and you can freely ride public transportation on that ticket for one hour, which is plenty of time to get where you need to in the city. If a conductor comes through the train asking for tickets, just show them the ticket and keep it. They aren’t collecting them, just looking at the time stamped on them. When deciding which to take, metro or train, you need to make sure that you know what station you are trying to get to. The metro and train lines only overlap at one station, Nørreport. If you need to go to the central train station, Københavns Hovedbanegård or København H, then you should take a train. Otherwise you are generally better off taking the metro instead. If you get on the wrong one, either way, you can go to Nørreport and then transfer to where you should be, but be aware that it isn’t the easiest station to figure out where you are going, so best just stop and ask someone to help you out if you get yourself turned around. The M2 metro line terminates at the airport. This is very handy since you don’t have to worry about which train to get on. Just get on any train at the station and you will go the right direction. The M2 and the M1 lines merge together and essentially become just one line once you get to the center. The three stations in the center (København K) are Christianshavn, Kongens Nytorv, and Nørreport. If you need to get to a station on the M1 in Amager (south of the center), like Bella Center, you can transfer at Christianshavn station. Cross the platform and get a train that is going to Vestamager (not back to the airport, Lufthavnen). Once you have your ticket, you need to get to the metro station. You will see an escalator which goes up one floor near the DSB office, conveniently labeled with a sign for the Metro. Go up the escalator (or elevator) and keep walking down the corridor. You will eventually end up on the metro platform. Get on a train and you are good to go. They depart every few minutes so if there isn’t one waiting, one will arrive shortly. It takes about 15 minutes into the center, depending on which station you are headed to, of course. To take the train, you will go down one level to the train tracks under terminal 3. The only important thing to watch for here is that you get on the Copenhagen train, not the Malmö train. When standing in front of the DSB office, looking at it, the Copenhagen train track is to your left. The Danish word for “track” is “spor.” You want Spor 2 towards København H. It is clearly marked, so just read the signs. Once on the track, just wait for the next train and board. You may have to wait for up to 20 minutes for the next train, but typically it is less than that. There are a number of stops on the way and the ride takes about 15 minutes. Obviously København H is a big stop and a lot of people get off there. They will also make an announcement in English as they get close to the station. I am normally a big taxi person, especially when I first arrive somewhere new. Taxis will obviously be more expensive and with the great train and metro service at the airport, they aren’t necessarily any faster. I haven’t used a taxi from the airport since my first visit. Sometimes if I have a lot of crap with me or I’m headed away from public transport, I’ll take the train into the center and then catch a cab from there to reduce the overall cost. If you are headed somewhere off the beaten path of the train/metro, or you are too tired to think at all, then taxi is the way to go. Once you walk past the wall of greeting people, go to the right and you will see a revolving door which leads to the taxi stand. Taxis here take credit cards, so you don’t have to worry about getting cash before hopping in. Of course the price will vary but, on average, the cost for a ride into the city center will be around 240-280 DKK ($40-$47, 32€-37€). You don’t have to tip, but it is nice to at least round up the amount. There is an ATM outside the arrival area. It is a Nordea bank machine, located all the way to the left as you come out of customs, at the beginning of the corridor to terminal 2. There is an information booth to the left when you walk out of customs. If you are dazed and confused, go there and they will get you set in the right direction. If you need a coffee fix, there is a Starbucks all the way to the right from the arrival area. I point this out, in particular, because there are only two Starbucks in all of Denmark and they are both located right here in the airport. One is behind security and the other one is publicly available outside of arrivals. That’s it. So if you need to get your Starbucks fix, you best get it now. If you don’t have to have Starbucks, there is also a Baresso up on the left, which is the largest coffee shop chain in Denmark.